Isn’t it frustrating when you watch what you eat, sweat it out at the gym and you still have those areas of stubborn, unwanted fat you just can’t move. Feel Good Laser & Skin Clinic in Richmond offer non surgical liposuction treatments for fat reduction in a walk-in, walk-out treatment with no recovery or downtime. To book a free consultation, give our friendly team a call on 1300 896 834 or you can book online. Having too much fat is linked with some serious health problems, however fat actually plays a vital role in your body. It is used as an energy source, it helps to protect and cushion your internal organs and it regulates your body temperature. 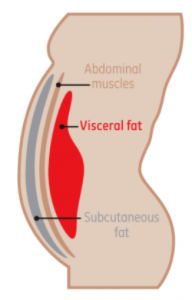 Visceral fat is linked to an increased risk of heart disease and diabetes and can only be reduced by exercise and diet. Subcutaneous fat is found between the layers of our skin and muscle tissue. This type of fat can form pockets around the body and is often referred to as exercise and diet resistant fat, as exercise and diet alone cannot shift these deposits. These pockets of subcutaneous fat are best targeted with liposuction or non surgical liposuction in Melbourne. With non-surgical liposuction or non invasive liposuction methods increasing in effectiveness there has been a trend away from surgical liposuction, mainly due to the high cost, time off work, long recovery period and risks. There are many different device options available on the market today and there is a big difference between devices and treatment outcomes. Fat reduction treatments also called body sculpting, temporarily empty the fat cells in a similar way to exercise or dieting. If you lead a healthy lifestyle and only have very small pockets of unwanted fat, then this could be a good option for you. Maintenance treatments are required between six and 18 months apart depending on your lifestyle. Feel Good Laser & Skin Clinic offer the industry leading VelaShape III, body contouring treatments that reduce your unwanted fat in this way. This treatment also has the added benefits of reducing cellulite and tightening skin after weight loss. We also offer UltraShape Power treatments which are true non-surgical liposuction or body sculpting treatments that damage fat cells in the target area. The dead fat cells are then cleared through your body’s natural immune system processes. There are many “fat reduction treatments” on the market in Melbourne and many make big promises that they don’t live up to. Many temporarily empty the fat cells (like exercise). Our UltraShape Power is a great alternative to surgical liposuction or fat freezing treatments, but without the surgery, time off work or recovery period. This is a walk-in, walk-out treatment and you can go right back to work or coffee with a friend. It has been studied in clinical trials and had more than 350,000 treatments performed worldwide. It is also rated the top non-surgical liposuction treatment on www.realself.com where consumers from all around the world post their reviews on the results they have had. The UltraShape Power is the latest and most powerful model by Syneron Candela. The best way to have your areas of unwanted fat assessed is by a qualified UltraShape clinician. At Feel Good Laser & Skin Clinic we offer a free confidential consultation. This is your opportunity to get personalised information based on your body goals. To book a free consultation, give our friendly team a call on 1300 896 834 or you can book online. While results vary from one person to the next, we have seen consistent and excellent results at Feel Good Laser & Skin Clinic, usually after 3 treatments spaced 2 weeks apart. See examples of UltraShape treatment results below for non surgical liposuction*. Any before and after photos displayed are / can be actual results from the device used at Feel Good Laser & Skin Clinic. However, results will vary and may be different for each individual. It is important to book a free consultation to have your concern assessed by our trained staff and a personalised non surgical treatment plan developed for you. The next step is for you to take action and book a complimentary consultation to have your areas of unwanted fat assessed is by a qualified Ultrashape clinician. At Feel Good Laser & Skin Clinic we offer a free confidential consultation. This is your opportunity to get personalised information and understand the technology and how many treatments you will need to achieve your goals. To book a free consultation, give our friendly team a call on 1300 896 834 or you can book online. It is advisable to exfoliate the skin with appropriate creams before treatment. You should attend the treatment with clean, dry skin (no perfume, no lotion). Shaving (not waxing) is advised, to aid with smooth movement of the applicator and to avoid overheating the treatment area. Our Clinicians are available to provide further information to you. Also, it is recommended that anticoagulants such as aspirin are avoided throughout the succession of treatments, if medical condition permits and pertinent to your physician’s approval. Anticoagulants can increase the possibility of bruising. Our Clinicians are available to provide further information to you.Our Clinicians are available to provide further information to you. After treatment, its is recommended that you resume your daily routine and there is no need for maintenance treatments as long as you maintain your weight with a healthy diet and exercise. It is suggested that weight gain is avoided to maximize results. A Healthy diet and routine exercise are strongly recommended to help clear the broken down (liquefied) fat and assist the body in burning (consume) the released free fatty acids as a source of energy. It will optimize your experience and may improve the results. Our Clinicians are available to provide further information to you.